The stage musical echoes the beloved Disney film, but doesn’t mimic it scene for scene. Standout voices and funny bits help this “Mermaid” make memories of its own. At Seattle’s 5th Avenue Theatre through Dec. 31. Today’s 30-somethings likely have a common string of deeply implanted memories associated with Disney’s 1989 film “The Little Mermaid” — the clamshell VHS case, the aquamarine-based color palette, the Calypso inflections of Alan Menken’s score. The film that kicked off Disney’s animation renaissance is situated in a nostalgia sweet spot; anything that stirs millennials’ beloved childhood memories is basically a license to print money. 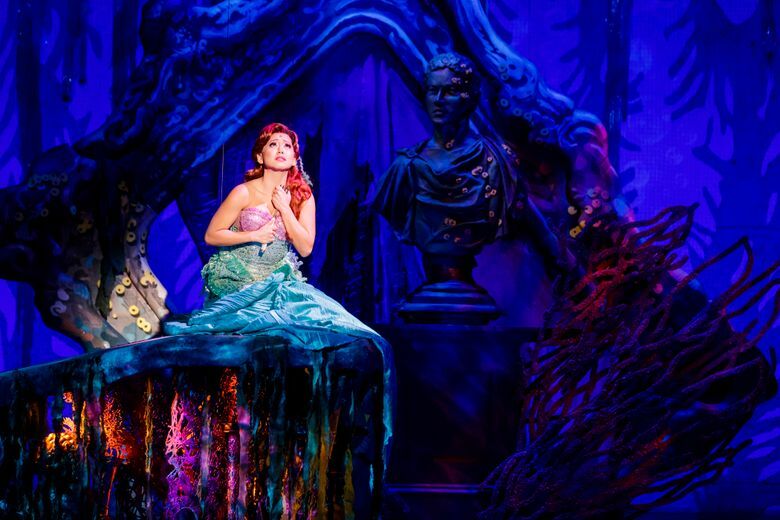 The musical version of “The Little Mermaid” is evocative of its source material in the best way. The film’s signature moments play out mostly unaltered, but they’re surrounded by a fresh framework that feels native to the stage — not reverse-engineered in an attempt to mimic the film’s appeal. After a 2008-09 Broadway run, director Glenn Casale came aboard to take a new approach to the material, and that version is the one on stage at the 5th Avenue Theatre. The production makes extensive use of flying harnesses to simulate swimming underwater, and the balletic aerial movements choreographed by Paul Rubin act as a perfect scene-setting device. Through Dec. 31, 5th Avenue Theatre, 1308 5th Ave., Seattle; $36-$190 (206-625-1900 or 5thavenue.org). Homegrown talent Diana Huey returns from New York to star as Ariel, the plucky mermaid who longs for a life on the land, but is deterred by her overprotective father, Triton, the king of the sea (Steve Blanchard). You’d better have enormous vocal talent to play a character whose singing voice enchants a prince and inflames a sea witch with jealousy, and Huey certainly does. Her crystal-clear, power-packed “Part of Your World” (Menken and lyricist Howard Ashman’s most obvious nod to Broadway in the film) is the kind that supplants all other versions in your memory. Huey cranks up Ariel’s petulance to the point where it’s a wonder that Triton still considers her his favorite daughter, but that voice obviously assuages a lot. The score is filled out with a number of additional songs composed by Menken, with lyrics by Glenn Slater, and most of these numbers integrate well with the originals, further expanding the score’s pastiche with girl-group harmonies (the mersisters’ “She’s in Love”), cabaret (Ursula’s “Daddy’s Little Angel”) and the requisite ballad (“If Only,” which eventually blossoms into a lovely quartet for Ariel, Sebastian, Triton and Matthew Kacergis’ Prince Eric). Doug Wright’s book gets a little too cute, referencing “Frozen” and dumping a boatload of aquatic wordplay like chum into the water. “Fish puns? Aren’t we better than that?” a mersister complains. Apparently not. Fortunately, puns aren’t the only source of humor here. Seagull Scuttle (Jamie Torcellini, doing an almost dead-on Nathan Lane) is a malapropism machine, and there’s a gleeful burst of slapstick with the arrival of pompous Chef Louis (Dane Stokinger) and his associates, who are no match for Sebastian’s claws. Structurally, Wright’s book is smartly written, streamlining story elements and not overlaboring added backstory for Ursula and Triton. And a simple line of dialogue reverses some of the story’s patriarchal underpinning, a change that elicited distinct cheers on opening night. Because this is “A Little Mermaid” not completely obsessed with conjuring up the joy of the past, it has a good chance of implanting some enduring memories of its own. Come on in; the water’s fine.